The "Essaic" Herbs, Cat's Claw Herb, Astragalus, Pau d'Arco, Chamomile, Hawthorne Berry. We offer the whole truth of our aloe processing. Herbal Aloe Force Re-Natures the cells, tissues, glands, organs and all systems of the body to function as originally designed. No Heat is ever applied at any time in any part of our Aloe processing from field to bottle. Stabilized and Purified without heat. No Water added or removed. Never concentrated, diluted or dried. Nature's designs and proportions are protected. 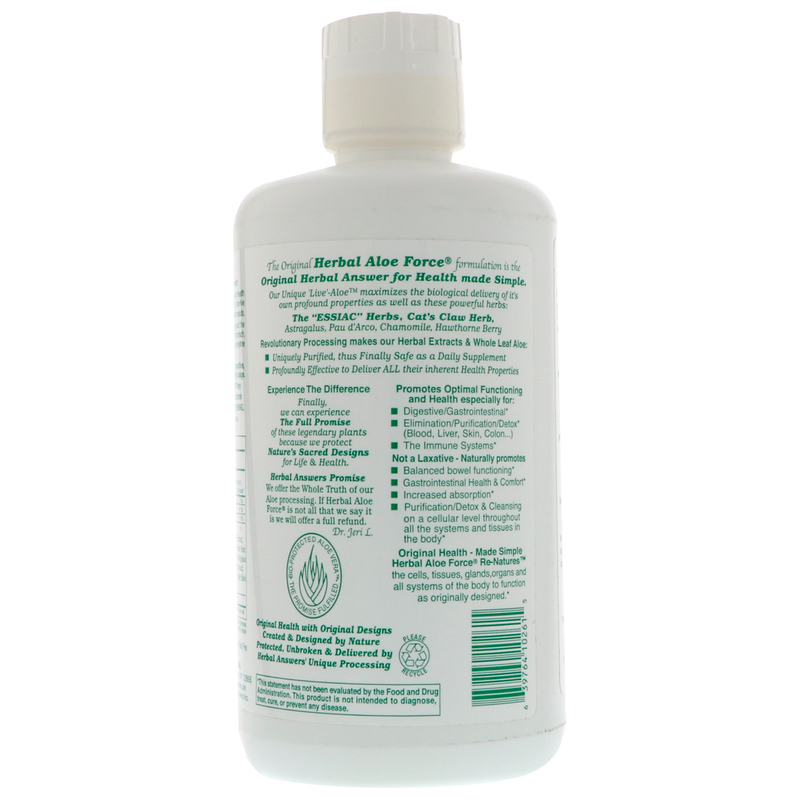 Aloin completely removed from the whole leaf & inner gel of the Aloe Barbadensis-Miller to ≤1 ppm. Natural Color & Flavor variance - not filtered out or covered over. The Herbs are extracted directly into the Aloe - increasing their absorption and delivery. Processed to protect & deliver aloe's naturally occurring constituents including the fragile enzymes, & Unique, large 'growth' polysaccharides (Aloe's Acetylated Beta-glucomannans). Usage will vary according to your health needs. From ½ to 1 oz or more, two-five times a day as needed or desired results. Best in split amounts throughout the day. Can be taken on an empty stomach, with juice, with other supplements, or anytime as needed. May be mixed with any cold drink. Potassium sorbate (1/10 of 1% as a preservative, not a source of potassium), fruit extract. Naturally gluten free; non-GMO aloin/toxin free. Natural color & flavor will vary. 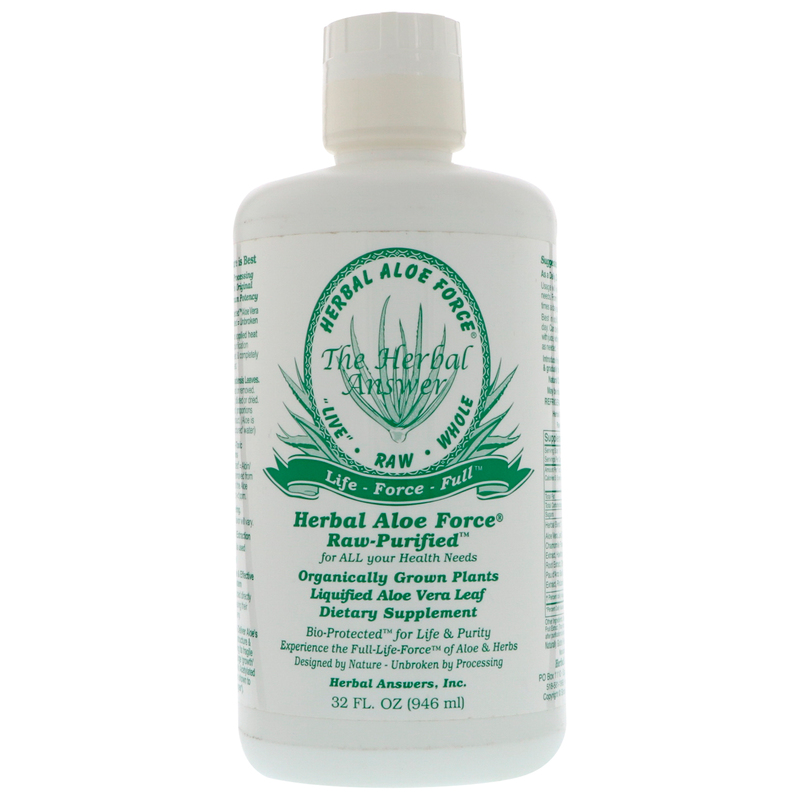 Herbal Aloe Force is 97% Aloe and 3% other ingredients (details below). †Percent daily values are not established.